It is never flattering to describe a woman as “large” or “big.” And yet, the Church in describing the immensity of the Blessed Virgin Mary, the Mother of God, pays her the greatest honour. Mary is described as the one “made more spacious than the heavens” or in Greek, “Playtera ton ouranon.” Wow! that’s big! The title also refers to the icon found in most Orthodox churches in a very prominent position - high in the front apse over the Altar and is often of such scale that it overwhelms and overshadows all other icons in the Church. The immensity of this icon can present a rather striking first impression especially to a non-Orthodox visitor. How is it that in a Christian church, a place where life centres around Christ, can an image of His mother appear to have such prominence? And so on this first day of the New Year, the Church speaks of her the greatness of the Ever-Virgin Mary, the Holy Theotokos, the Mother of God, because she carried God within her. Let us just pause for a moment to consider how enormous a challenge that really was. It is already almost impossible to fathom this immensely vast universe of ours, we a mere a speck of dust. Our galaxy, just a tiny portion of the universe, is big enough for light to take 100,000 years to cross it. The edge of the observable universe, which our present astronomical instruments allow us to preview, may just be the tip of the iceberg of uncharted territories that have formed the stuff of science fiction speculations in movies like Star Trek. Simply the Universe we know about is mind-bogglingly big. Yet, we recognise that God is far greater than that. The universe, for all its vastness, remains finite. God, on the other hand, is infinite! But here is the great mystery we celebrate today – God who could not be contained in his created universe chose to be contained in the tiny womb of this human being. Thus we call Her “more Spacious than the Heavens” because she held in Her womb Him who holds the whole universe. She succeeds where the whole universe fails. Thus the Eastern Orthodox Akhatist hymn exalts her position, “You were made more spacious than the heavens, O Most Pure Mother, for God cannot be contained by the whole universe, and yet He chose to be contained in your womb for the sake of our salvation.” Such designation appears fitting when one considers that, within her womb, she contained the Creator of the universe. Perhaps, due to attacks from Protestants, we have become embarrassed of such titles being accorded to Mary or to any other human person. How could a creature be deemed as the mother of her Creator? How could a mere human give birth to God? And yet, it is precisely this preposterous belief that forms the basis for our celebration of Christmas. God did not become man in a vacuum. He did not beam himself down from the heavenly heights and materialise in human form. At Christmas, we celebrate how God chose to be born of the Virgin Mary. In order for Him to assume our humanity, the Blessed Virgin Mary truly had to give birth to God. Since Mary is Jesus’ mother, it must be concluded that she is also the Mother of God: If Mary is the mother of Jesus, and if Jesus is God, then Mary is the Mother of God. There is no way out of this logical syllogism. Of course, we are not saying that Mary brought God into being. If this was the case, then together with the Protestants we have much cause for concern, because it would be raising a mere creature to a level above her Creator. This is not what the Church teaches. Although Mary is the Mother of God, she is not his mother in the sense that she is older than God or the source of her Son’s divinity, for she is neither. Rather, we say that she is the Mother of God in the sense that she carried in her womb a divine person—Jesus Christ, God "in the flesh" - (and in the sense that she contributed the genetic matter to the human form God took in Jesus Christ. Mary is indeed a cosmos to herself with Christ as its solar centre. Thus, the Platytera is less an image of Mary as an image of Christ, in the same way that today’s feast of the Feast of Mary, Mother of God, is less about the Mother than it is about the Son. As Christ is at the very front and centre of the Platytera icon, Christ too is at the heart of today’s Marian feast. Though, this feast seems dedicate to her, note that she is in the background not in the foreground of our celebration. Both the icon and today’s feast shows the traditional view of the Church concerning the place and essential role of Mary in God’s divine economy – his plan of salvation. She is indispensable because without her, Christ’s birth could not have taken place. The pre-existent Word could not have become flesh if not for her fiat. Christ could not have been born without her free consent. 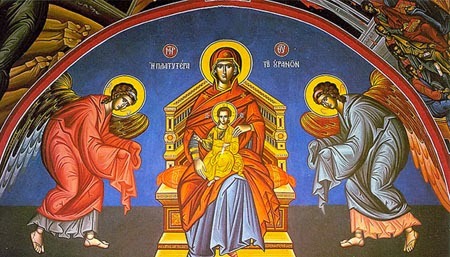 Just as the icon of the Platytera straddles the upper levels of the Church and connects it with the lower levels, our Blessed Mother is the heavenly ladder, whereby God has descended and she is the bridge leading those on earth to heaven. The Mother of God, she who is “made more spacious than the heavens,” stands between the heavens and the earth and serves as a bridge between. Let us therefore ascend to the heavenly heights and enter into the Holy of Holies. Let us go up to the mountain of the Lord, the Heavenly Jerusalem, for Our Lady, the Blessed Virgin Mary, the Holy Theotokos and Mother of God, has already bridged what was previously impassable. Through her co-mediation, she has allowed us to approach what was previously unapproachable and to comprehend what was previously incomprehensible.